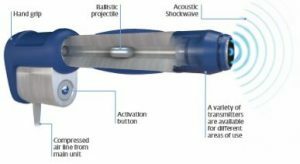 Radial shockwave therapy is a safe and non-invasive method that utilises high-vitality energy waves to invigorate the bloodstream to the influenced territory, thereby instructing the body into repairing the tissue individually and empowering the process of recuperating. Shockwaves are pulses generated by compressed air. Shockwave therapy involves the application of high energy pressure wave through the surface of the skin to accelerate the healing process and reduce pain. Repeated shockwaves to the affected area create a revascularisation effect, with new blood flow to the area promoting tissue healing and regeneration. 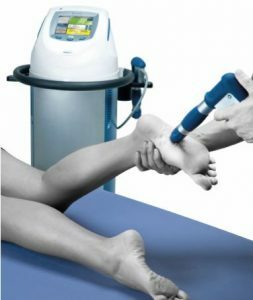 This system, as a rule, keeps going around 30 minutes and is utilised to treat harmed ligaments or interminable foot sole pain. 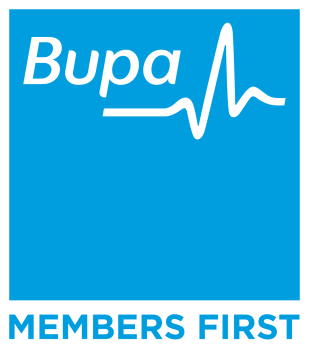 After a thorough examination of the affected area to accurately diagnose the injury, our podiatrist will mark the affected areas and trigger points. Shockwave is applied via a handheld probe after gel is applied to help conduct the waves. The shockwave sessions takes about 20-30 minutes depending on the number of locations and injuries. It is mildly uncomfortable but not painful at all. The best way to describe it is, like being gently flicked with a small rubber band. During the procedure, if our patients experience pain, we lower the intensity of the wave and that usually addresses the issue. As the condition improves, the areas will become less painful. We recommend 3-8 sessions, spaced 5-7 days apart. Therapy is more successful with active patient participation, where the patient tells the therapist whether or not the probe is at the area of pain. Side effects could occur after a treatment with Radial Shockwave Therapy. The majority will appear after 1-2 days and usual abate after 3-5 days.